It's no wonder we look to Warren Buffett quotes for investing inspiration. The man is considered the most successful investor of the entire 20th century. He went from selling chewing gum door to door as a child, to managing a company that beat the S&P 500 43 out of 44 years on a five-year rolling average basis. Today, Warren Buffett, a.k.a. the "Oracle of Omaha" a.k.a. 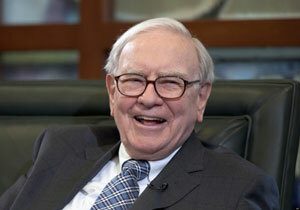 CEO and chairman of Berkshire Hathaway Inc. (NYSE: BRK.A, BRK.B), has a net worth of $73.1 billion. "The best thing that happens to us is when a great company gets into temporary trouble…We want to buy them when they're on the operating table." – to Businessweek senior writer Anthony Bianco, 1999. "I try to buy stock in businesses that are so wonderful that an idiot can run them. Because sooner or later, one will." – in a panel discussion following the premiere of the documentary I.O.U.S.A., 2008. "Whether we're talking about socks or stocks, I like buying quality merchandise when it is marked down." – written in Buffett's letter to shareholders, 2008. "It's far better to buy a wonderful company at a fair price than a fair company at a wonderful price." – in a letter to shareholders, 1989. "Wall Street is the only place that people ride to in a Rolls-Royce to get advice from those who take the subway." – to reporter Linda Grant of The Los Angeles Times, April 1991. "When you combine ignorance and leverage, you get some pretty interesting results." – talking about how brokers and analysts, even the young and inexperienced ones, are always quick to give advice, regardless whether it's good or not, 2008. "Our approach is very much profiting from lack of change rather than from change. With Wrigley chewing gum, it's the lack of change that appeals to me. I don't think it is going to be hurt by the Internet. That's the kind of business I like." – to Businessweek senior writer Anthony Bianco, 1999. Buffett's never tried to profit from the Internet's disruption on business because he knows he doesn't understand the business model. "Someone is sitting in the shade today because someone planted a tree a long time ago." – in Of Permanent Value: The Story of Warren Buffett by Andrew Kilpatrick, 2007. "When we own portions of outstanding businesses with outstanding managements, our favorite holding period is forever." – in a letter to shareholders, 1988. "I never attempt to make money on the stock market. I buy on the assumption that they could close the market the next day and not reopen it for five years." – in a letter to shareholders, early 2000's. "Buy into a company because you want to own it, not because you want the stock to go up." – in an interview with Forbes, 1974. "Time is the friend of the wonderful business, the enemy of the mediocre." – in a letter to shareholders, 1989. "Investors should remember that excitement and expenses are their enemies." – in a letter to shareholders, 2014. "The most important thing to do if you find yourself in a hole is to stop digging." "Should you find yourself in a chronically leaking boat, energy devoted to changing vessels is likely to be more productive than energy devoted to patching leaks." – in a letter to shareholders, 1986. "You're dealing with a lot of silly people in the marketplace; it's like a great big casino and everyone else is boozing. If you can stick with Pepsi, you should be O.K." – in a Forbes interview, 1974. "You want to be greedy when others are fearful. You want to be fearful when others are greedy. It's that simple." – in an interview with Charlie Rose on PBS, 2008. "We never want to count on the kindness of strangers in order to meet tomorrow's obligations. When forced to choose, I will not trade even a night's sleep for the chance of extra profits." – in a letter to shareholders, 2008. "After all, you only find out who is swimming naked when the tide goes out." – in a letter to shareholders, 2001. "If past history was all there was to the game, the richest people would be librarians." – in a letter to shareholders, 1990. "You don't need to be a rocket scientist. Investing is not a game where the guy with the 160 IQ beats the guy with 130 IQ." – to MSNBC. "Rule No. 1: never lose money; rule No. 2: don't forget rule No. 1." – in The Tao of Warren Buffett, 2006. Thanks. for the last 15 years i have making investments in realestate and other industries.I am impressed with the legendry philosphy of mr Warren Buffet.We like to follow his foot steps and your guidance. Because now is the real testing time to grow against all the odds. It will always probably be my favorite, not because of its perfection. It's my favorite because this quote prompted me, despite my own fears and trepidation, to become an investor. For that reason alone, it will always have a special place in my heart. Thanks money-morning for publishing such kind of helpful article.